The power of crowd sourcing becomes obvious in its quantum application in a new experiment by the Japanese Space Agency. 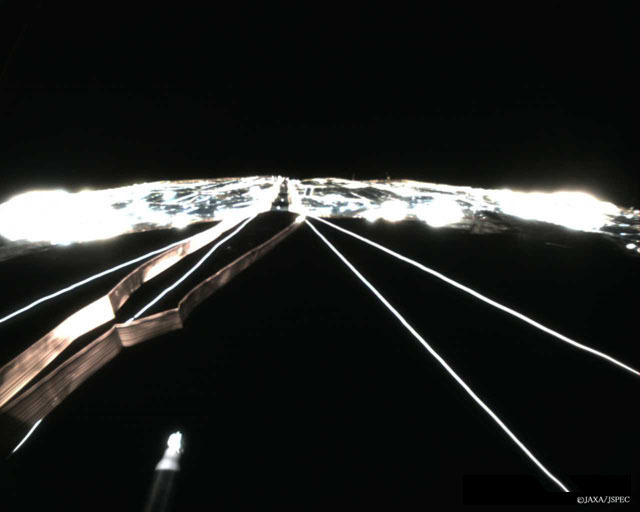 "A new space propulsion technology dubbed Solar Sail has been put to test in space ... When a photon strikes the surface of the sail, it bounces off, imparting its momentum to the sail. Each photon might not deliver much thrust, possibly a few millionths of a g, but due to its constant impact, it allows a build up of large velocity change over time which is ideal for long space travels." A photon, frail by itself as a source of thrust yet empowering and essential to the terrestrial ecosystem by its contribution to the photosynthetic process, makes its electromagnetic qualities visible through macroscopic effects. Scientists have demonstrated here that photons are capable of displaying particle qualities by harnessing its power in a swarm state. Is this related to the ICARUS project? I'm not too familiar with these although I find this subject highly interesting.